The funeral of Cameroon international Patrick Ekeng has been held in Yaounde, following his death during a league match in Romania on 6 May. Ekeng died aged 26 of a suspected heart attack after collapsing on the pitch playing for Dinamo Bucharest. 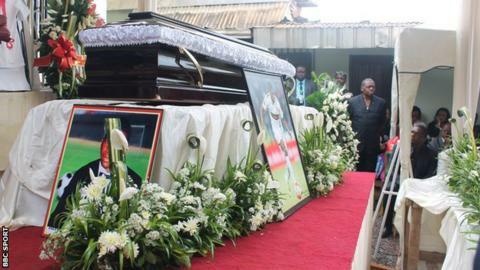 Cameroon players past and present attended the service, and gave support to Ekeng's wife and family. The country's sports minister Bidoung Kpwatt also attended, representing Cameroon's president Paul Biya. Ekeng's brother Jacques Ekeng, paid tribute to "Patou" as he was known. "He gave more love to his friends than to his family. That is Patrick, he was generous," Jacques Ekeng said. "No matter the beauty, riches and cars, you cannot be saved from death," he told his brother's friends. "My brother is dead with a smile, and this is what comforts me." Ekeng's club Dinamo Bucharest said they would honour the player's memory by sending the Romanian Cup to his family in Cameroon if they win the trophy. The 13-time winners face CFR Cluj in the postponed final on 17 May.